It was a good environment for a hockey game. 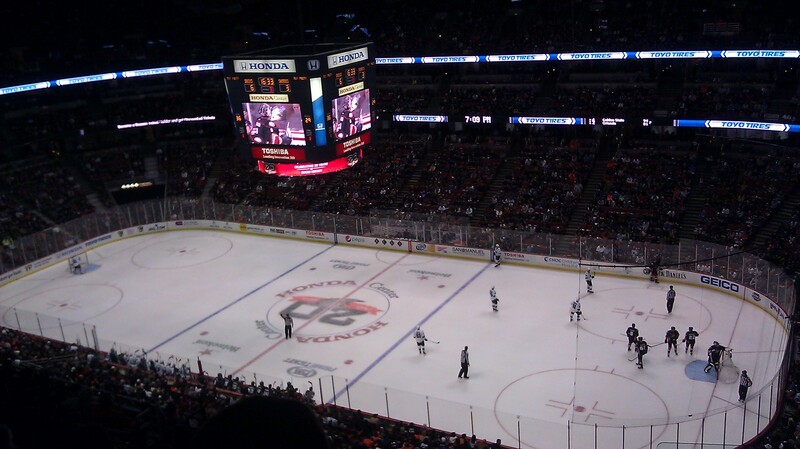 I went to the Honda Center (I still call it “The Pond”) for the first time ever to catch the Ducks take on the Sharks. This was something I had wanted to do for a while and with the Sharks in town for New Year’s Eve, I decided why not? The entire arena itself is pretty nice. It’s not messy and it’s easy to maneuver around. Ducks fans weren’t arrogant as I thought they were and I suppose it was nice for them not to have me be all loud since the Sharks stunk it up. But overall, the experience was nice. It wasn’t even expensive and getting there was easy. The goal horn isn’t as annoying as the one the Kings use, so I at least know I will likely be back here for one more game this year. This entry was posted in Anaheim Ducks, NHL, San Jose Sharks and tagged Honda Center. Bookmark the permalink.